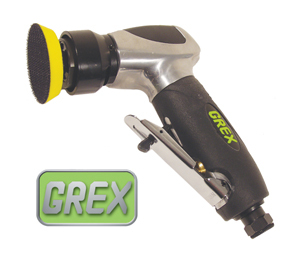 This pneumatic random orbit sander features a 105° head angle to promote access to confined places and provide an ergonomic design, a 2" Hook and Loop Pad and a patented one-piece aluminum housing that eliminates vibration. Random orbit sanders are good for finer grits sanding with the lathe stopped. It will not leave swirls. It is powered by an air compressor that is 2-1/2 hp or larger. A 3" pad is available as an option as is a pair of shaft extensions for getting into deeper turnings. The extensions measure 3" and 5".